What would the world be lacking if God settled for okay? In the beginning, God created new things that had never before existed and then He called them good. Not okay, not passable; GOOD. We are charged with being good stewards of what God provides us. Why do we settle for just okay? You may know we’ve got the best message ever to tell people and a bullhorn with which to do it, but then we bury it in okay songs with not great storytellers while we’re trying to convince listeners to come support the thing we’re doing because we think they should and then wonder why listeners aren’t loyal to our station. Even if you’re not in a decision-making position at your radio station, you have the opportunity today to strive for better, even greatness. Ask God today to use you to accomplish His purposes. Decision makers, for what are you waiting? The Natural Church Development process identifies eight characteristics of successful churches and, to get the point across, uses a barrel with staves (helpful for visual people). 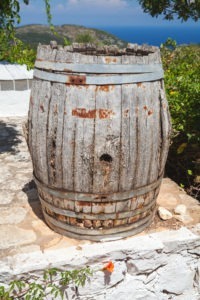 The lowest stave determines how much water the barrel will hold. Build up that stave and the barrel holds more water. The next step is to identify and build up the next lowest stave. The process repeats until the church is functioning well with all eight characteristics fully developed and engaged. You might imagine, this process never truly ends; rather, it’s a constant evaluation of what can be better and dedication to making it so. Let’s imagine our on-air product is the barrel with five staves – music, talent, imaging, underwriting/commercials, promotions. What’s the lowest stave in your on-air barrel? To ask it another way, where do the listeners run out? Identifying and building up the low points give your listeners more reasons to stick around and provide you the opportunity to continually evaluate your product while fulfilling the mission. To be fair, most organizations realize it’s next to impossible to overachieve in all areas and so settle on one area in which they’re willing to be “just okay.” In the store where employees wear blue vests, have you ever tried to find customer support when you had a question? That’s their “just okay” area. Your on-air product should never be the “just okay” part of your radio station. I encourage you to be invested and interested in your on-air product. If you’re not, why should anyone else be? Evaluate what needs to improve and then effect the changes. Ask for help; you don’t have to have all the answers. Give the good news wrapped in great songs and relevant storytelling while inviting listeners to be part of something bigger. It is a labor of love and an act of service for it is the King of Kings to whom we answer and by whom we are called. What needs your attention today to begin the journey to greatness? Expect that tomorrow the answer likely will be different.